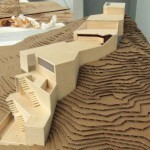 The final design for the bath house stayed true to the themes and ideas of the midterm proposal. Because the jury liked where I was headed overall, I was able to keep the scheme, while applying some visible aesthetic variations. The geometries in the midterm proposal weren’t really working for me. The irregularity of the layout resulted in some awkward spaces, and at no point in the midterm version was there a space where the entirety of the project really opened up and gave the patron a sense of scale: the entire thing seemed like it would become a collection of cramped rooms. For the final proposal, then, I implemented a much more linear parti, limiting my use of angles only to the places they seemed needed. As a result, the entire program seems to flow better and the effect of a bath house cascading down the mountain seems to be more strongly implied. Also, the entrance to the main bath areas after the changing rooms becomes a double height lofted space, unifying the programs and creating an “anchor” for the entire structure. This also allowed for an almost doubling of available area within the project. Roofs of lower levels become the decks of upper level creating a duality of experiences; those within the structure and those on the structure. The patron is invited to experience either the interior baths and spas with their selective views, or the exterior pools and decks, exposing him or her self to the surrounding elements. These are the drawings I turned in. Click on the image to view a full size PDF. Here is a rendering poster I turned in. Click on the image to view a full size PDF. This is a rendering of the eastern perspective. Click on the image to view a larger size. This aerial perspective gives a good idea of the entire layout. Click on the image to view a larger size. Here is a view of the unifying loft space. Click on the image to view a larger size. 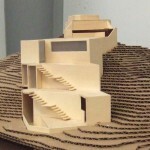 Southeast view on physical model. Eastern view of the physical model. 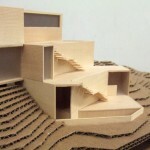 View of lower levels on physical model.